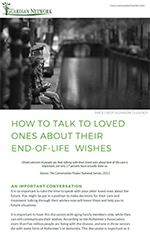 Download our free eBook and get the conversation started. The experts behind The Guardian Network are able to assist families with a comprehensive Medicaid proposal, taking much of the guesswork out of a complex process. If approved, Medicaid can help pay for your Medicare premiums, deductibles, and/or coinsurance. Our comprehensive Elderly & Disabled Life Plan Assessment analyzes individual social, medical, personal documents, bill pay, budgeting, property and current benefits for a big-picture approach to ensure increased quality of life. We determine the many options, resources, and solutions for a successful life plan. The Guardian Network’s parent company, Guardian Care Management & Benefits Services, Inc., has been providing professional guardian and care management services for Central Florida and beyond for more than 25 years. The GCMBS team is available for all care management services. We help navigate through Florida's Agency for Persons with Disabilities process and optimize the benefits for those who have one of the following six developmental disabilities: autism, cerebral palsy, intellectual disabilities, Down syndrome, Prader-Willi syndrome, spina bifida or children age 3-5 who are at a high risk of a developmental disability.